[Click picture to Enlarge] Aerial view of Vali Ahd Square (Meydan e Vali Ahd) in 1971 (Picture source: R. Tarverdi (Editor) & A. Massoudi (Art editor), The land of Kings, Tehran: Rahnama Publications, 1971). Pahlavi avenue ingress to Vali Ahd Square (Meydan e Vali Ahd) in the 1960s (Picture source: Fouman.com). 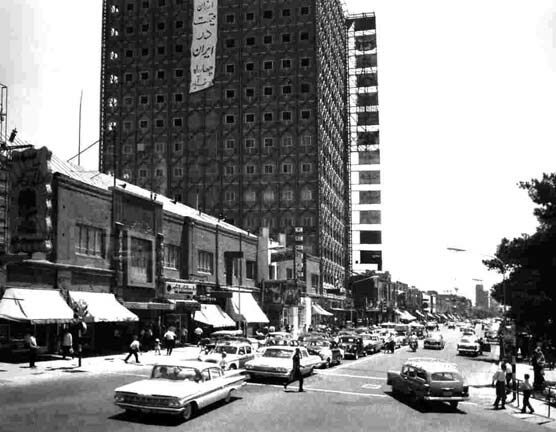 Tehran’s Hilton Hotel in 1961 (Picture source: Iranian.com). [Click picture to Enlarge] Mehrabad airport in 1971. Note the four-engined Boeing 707. Mehrabad was to become one of the busiest and most modern airports in Western Asia by the late 1970s (Picture source: R. Tarverdi (Editor) & A. Massoudi (Art editor), The land of Kings, Tehran: Rahnama Publications, 1971). [Click picture to Enlarge] Takht e Jamshid Avenue in the 1971. Firdowsi avenue towards the north as seen in the 1960s. [Click picture to Enlarge] Queen Elizabeth Boulevard in 1971 (Picture source: R. Tarverdi (Editor) & A. Massoudi (Art editor), The land of Kings, Tehran: Rahnama Publications, 1971). [Click picture to Enlarge] Aerial View of Tehran University in the 1970s (Picture source: R. Tarverdi (Editor) & A. Massoudi (Art editor), The land of Kings, Tehran: Rahnama Publications, 1971). [Click picture to Enlarge] Entrance to Tehran University in 1971 (Picture source: R. Tarverdi (Editor) & A. Massoudi (Art editor), The land of Kings, Tehran: Rahnama Publications, 1971). [Click picture to Enlarge] Tehran university students in 1971 (Picture source: R. Tarverdi (Editor) & A. Massoudi (Art editor), The land of Kings, Tehran: Rahnama Publications, 1971). Iranian university students in the 1970s. [Click picture to Enlarge] Medical students at Tehran University. [Click picture to Enlarge] The Shemshak ski resort in 1971 (Picture source: R. Tarverdi (Editor) & A. Massoudi (Art editor), The land of Kings, Tehran: Rahnama Publications, 1971). The Abeali Ski resort in 1966 (Picture Source: Iranian.com). [Click to Enlarge] The late actor Mohammad-Ali Fardin (1933-2000). Ski enthusiasts at the Abeali Ski resort in 1966. Am Iranian Pepsi-Cola cap from the 1970s. Tehranis often claimed that their version of Pepsi-Cola was better tasting than the American original! Golden City Cinema in 1971 (Picture source: Fouman.com). Tehran’s posh Chattanooga restaurant and coffee bar in 1966. [Click picture to Enlarge] The Tehran Twist: The Tehran jet-set entertaining themselves with rock and roll music in the early 1960s (Picture Source and with special thanks to: Shamsi V (Original photographer) posted in Flickr). [Click picture to Enlarge] Old men amusing themselves with water-pipes on Isfahan street in the 1960s. [Click picture to Enlarge] A Tehran government official takes a break from the office. [Click picture to Enlarge] The Kourosh department store in the 1970s. The department store also featured a popular restaurant on its top floor (Picture source: R. Tarverdi (Editor) & A. Massoudi (Art editor), The land of Kings, Tehran: Rahnama Publications, 1971). [Click picture to Enlarge] Mother shopping for her young son in the children’s section of a Tehran department store in 1971 (Picture source: R. Tarverdi (Editor) & A. Massoudi (Art editor), The land of Kings, Tehran: Rahnama Publications, 1971). Iran radio station circa early 1970s. [Click picture to Enlarge] A Tehran hospital operating room in 1971 (Picture source: R. Tarverdi (Editor) & A. Massoudi (Art editor), The land of Kings, Tehran: Rahnama Publications, 1971).